Mughal love paintings capture ones imagination because of their unique style and choice of themes. Emperor Jahangir, who had a keen artistic sense, encouraged and helped in the development of Mughal love paintings. His contribution in encouraging love paintings is greatly acknowledged. 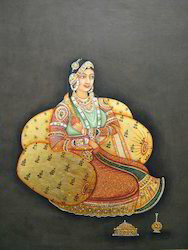 Mughal paintings achieved new delicacy and romatic flavour during the reign of Shah Jahan. 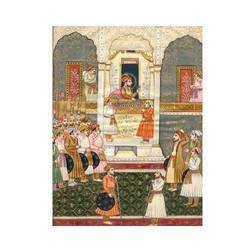 Love, romance, portraits and court scenes became the common themes for the mughal paintings. In the mughal court scene paintings, the court scenes are depicted in grandeur and they were rich in variety which included portraits, events and court scenes from the court life. They depict the emperor sitting on a high throne and subjects offering him their valuable things. 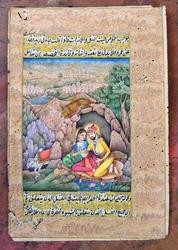 The rich and colorful miniature paintings produced under Mughals had strong Persian influence. 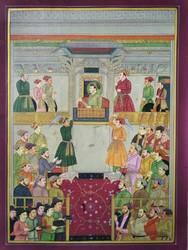 Fine Painting of Akbar court scene by artist Harish Kumar . With single hair brush this type of fine miniature work performs . 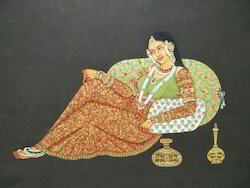 mughal lady painting by artist Harish kumar. 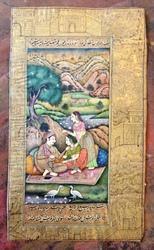 Looking for Mughal Paintings ?